We all know the importance of keeping the whole family healthy and active, so we’ve put together a huge range of activities not just for the kids but for the whole family to enjoy together. Whether it’s enjoying a meal together in our restaurant or having fun together during one of our social events, we have something for all our members, whatever their age. We have lots of fun activities that will keep your kids happy and entertained. We even do private parties and events. So whether you want to relax, have fun or enjoy some quality time together, we’ve got it all covered. We carefully select fresh, seasonal produce and serve high quality, balanced and delicious meals, and we have something for everyone. Whatever the time of day we have you covered, a quick morning snack, or a lengthy lunch, breakfast on the sunny terrace or a quick snack by the pool. Our favourite spot in the summer is our pool bar. Sip on an aperitif whilst enjoying the sunshine, take a dip in our beautiful outdoor pools or grab some lunch. With so many family friendly activities it’s no surprise that families love spending time at David Lloyd Clubs. Go swimming, play tennis, eat; breakfast, lunch and dinner and let the kids climb around the playframe. Before you know it the day will nearly be over, but not before a quick visit to the spa whilst we keep the kids entertained in a DL Kids session. We love how friendly and social our clubs are, and with a range of events and a busy social calendar that includes kids’ entertainers, social evenings and coffee mornings, there is plenty to get involved with. 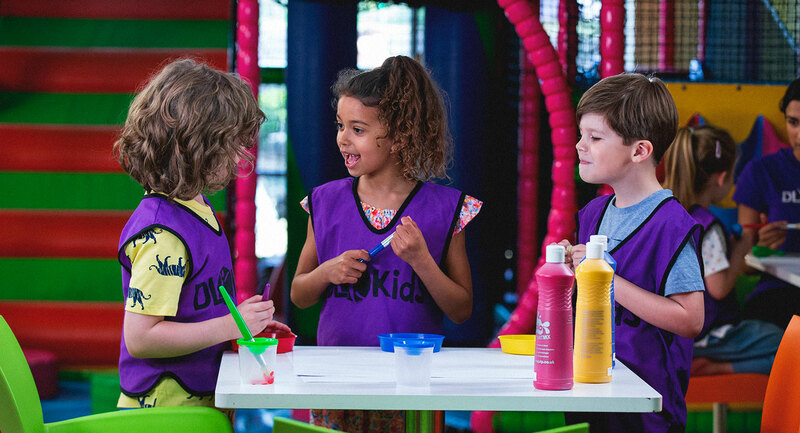 Our brilliant DL Kids programme is a great way to keep your kids active and healthy, all whilst having lots of fun. Even better, we have deliberately timed these sessions to match up with our group exercise classes, so whilst the kids are having fun doing arts and crafts, or playing games, you can book yourself onto a class. It’s a great way to keep them running around, learning new skills and sports and having fun as they make new friends. Our All stars programmes are a great way to allow your kids to learn new skills in a fun environment. With tennis, padel and swimming programmes, our expert coaches start with the basics and then gradually teach them ways to improve and progress in their sport, all whilst having plenty of fun. The only problem is that they could soon be better than you! Whatever your kids age, we have something for them. For our very youngest members, we have our brilliant, fully qualified crèche team, who really enjoy caring for small children. As well as our brilliant DL Kids, Holiday active and All Stars programme, we offer special gym, tennis and swim sessions for members 11years+, giving them plenty of ways to keep active. Everyone loves a party and we love organising them, we do brilliant themes, tasty party food, plus party bags and invitations. Simply turn up with a cake, some guests and the birthday child, and leave the rest to us. It’s not just birthdays; we can provide a wide range of venues and services for celebrations, corporate events, meeting rooms and social club events. Whether you want your event indoors or out, we will make sure you have an unforgettable day. We take care of everything so all you have to do is enjoy yourself. Ready to be a member?